10 cm smoky quartz with crystallized pink quartz from pocket 3 of 2007 . We continued working pocket 2 for about a week. We had to blast the floor in front of the pocket several times in order to get to the level of the pocket bottom. In this process we were creating a sump hole that had to be continually pumped. We removed quite a bit of pocket material. However, several spaces receded into the wall far beyond our reach. Each of the these had a milky quartz hood and a drusy tourmaline floor with clevealandite. By the 2nd week in May we had worked this pocket as far as we could. In order to explore further we would have to do another burn. Like the last one, this burn was directed almost due east. We started it on the far right side of the room, now dubbed the 'Pink Room' for all the crystallized pink quartz we had recovered. 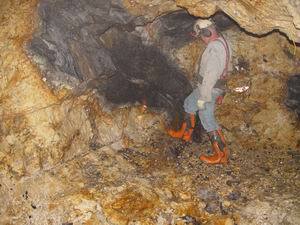 When we first started underground each burn was drilled to a depth of 2m (6'). But as we became more proficient at executing the burn, we graduated to 2.6m (8') burns . Now we were ready to do a 3.2m burn. The driver for this was the cost of detonators. Regardless of the depth of the burn, a fixed number of detonators was required . Our burn pattern required 20 detonators costing approximately 80$. If everything worked we would be left with a 1.3m square opening 3.2m deep. For the burn to pull properly all of the holes would have to be perfectly parallel and spaced properly. Any deviation from parallel would either place the back of the hole outside of the pulling zone or, worse, cause us to drill into another hole. Such intersections often caused the drill steel to become lodged tightly into the intercepted hole. Freeing the steel often took more than a hour and sometimes resulted in the loss of the steel. However, this burn was drilled without incident and pulled uncommonly well. We were satisfied. 'Guard dog' Buddy congratulates Richard on a burn well executed. placed the burn substantially below ceiling, we still intercepted the hang walling ( upper contact). 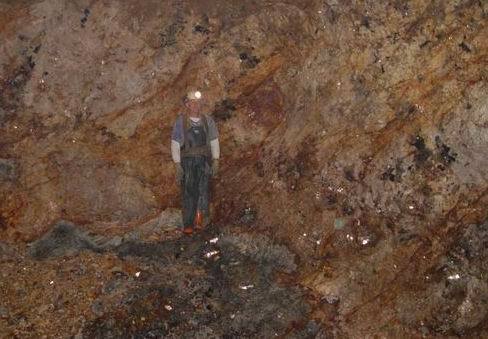 Unlike other areas we had mined, the contact was irregular and apparently contained a number of pendant masses of schist. 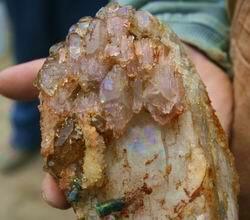 We were curious to learn what effect these may have on the pegmatite. Expanding the burn still further ,and eventually after much blasting ,we reached the minerlarized zone. Our small Komatsu excavator allowed us to reach down and muck out the deepening trench required to reach this zone. Without this machine, this effort would have been impossible. 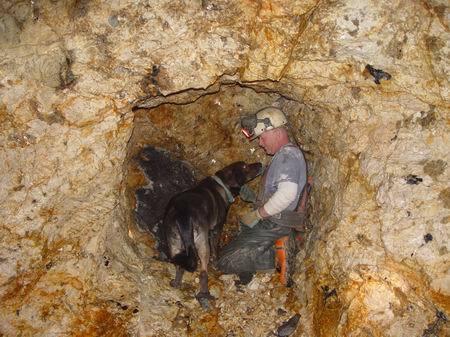 As we dug down we were encouraged to see how enriched the mineralized zone was. Over a layer of lithia minerals, mainly lepidolite, cafeteria tray sized mica books , with points down and interlaced with green tourmaline, formed in a continuous band. 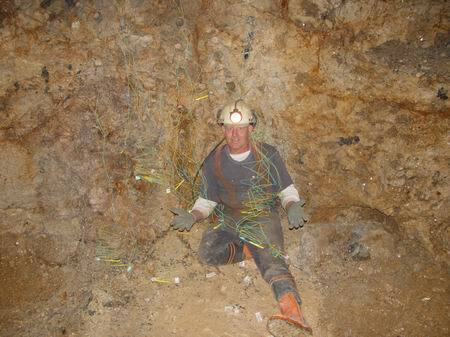 The deep but highly enriched mineralized zone. Large mica books, lepidolite, drusy tourmaline, clevealandite and a schorl going to green are visible. This image of the left side of the Pink Room shows how steeply the mineralized zone is dropping. At Richard's feet, the garnet line goes vertical. The picture hints at the volume of the excavation. the front of the advance. The space contained a number of quartz crystals and a very special one. Shown at the top of this page a near perfect and very glassy smoky quartz was nestled in the soft clay at the bottom of the pocket. 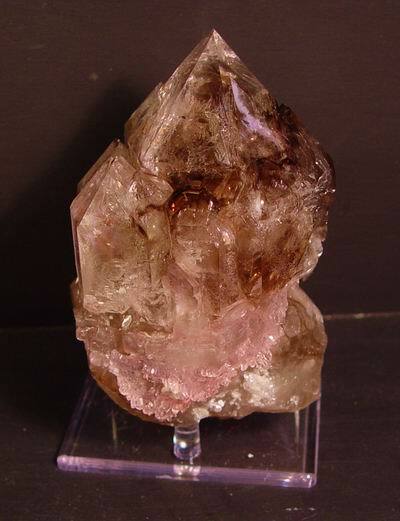 A skirt of pink crystallized quartz circled the base nearly completely. Even uncleaned, it was clear this was an exceptional piece. It has been described by a person knowledgeable in Mount Mica material as one of the finest quartz crystals to be produced there. 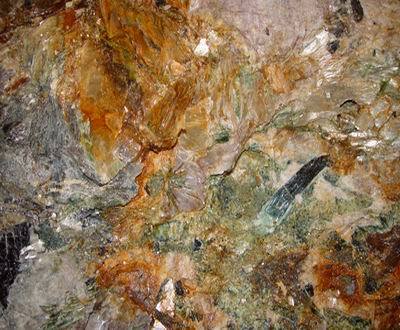 Embedded within the fine white kaolin that filled much of the pocket were a few minor tourmaline crystals. to Mount Mica, we gave the workshop participants free reign underground and in the open pit areas. They could dig anywhere they wanted. The only rule was that anything found underground had to be shown to us. We retained the right to keep anything significant. By in large most of the participants abided by this rule. As mentioned above, the spaces at the back of pocket 2 seemed to be continuing into the wall. Working conditions though were not good as the effort to reach the pocket floor had created a sump that collected water. Since Richard and I were part of the long haul, we had decided to attack the continuation of pocket 2 after we had worked the down dip side (right) of our latest advance. This would have provided a lower area for the water that had built up in front of pocket 2 to drain and thus improve the working conditions. The workshop people had only one day. so two of them, Jim Nizamoff and Dave Guinn, decided to brave the water and explore the pocket. 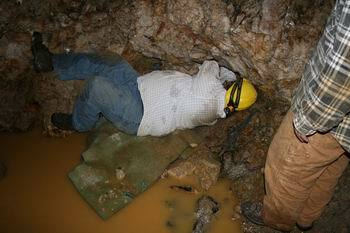 Their sacrifice was rewarded as they were able to dislodge a piece of quartz and gain access to new chamber. 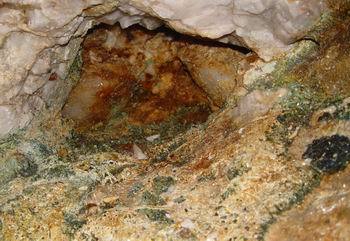 Inside this chamber were several quartz crystals with crystallized pink quartz. In the photo above the otherwise pedestrian quartz crystal plate has developed pink terminations on most of its points. Though found underground, we chose to let this one 'get away'.